Draped over the terraced slopes of Mt. 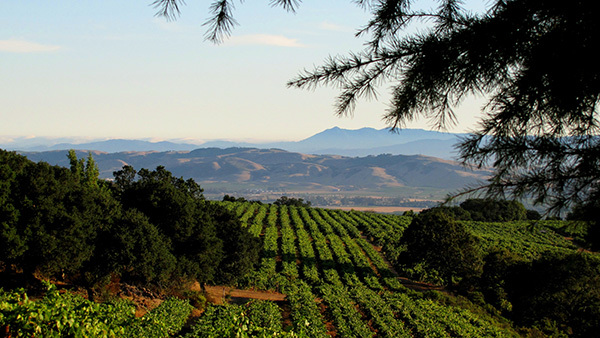 Pisgah, the Monte Rosso Vineyard basks in the sun above the fog line of the Valley of the Moon. The geography was shaped by volcanic activity 50 million years ago, from lava which spewed out of the side of Mt. Veeder and ran towards the San Pablo Bay. Over time the Lava at the surface has decomposed leaving powdery red volcanic clay that hides the layers of shattered shale beneath the surface. The struggle for survival in this relatively arid environment is aided by a peculiar feature of the soils. The shale itself is a type of clay that contains miniscule ash water pockets that act as a reservoir for the root hairs. The fissures in the shattered shale provide the access for the larger roots to burrow down to depths of twenty and more feet. This has allowed some vines to survive, dry farmed for over a century. As important as the soils which loan a ferrous-dusty mineral component to the aromas of the wine, the climatic factors are the reason Monte Rosso wines age so well. Exposure on the terraces runs from South East to the North West, from an elevation of 800 feet to 1200 feet. This is like the artist’s easel; the sun is the paint, the vineyard the canvas. With this exposure comes cool air rising from the San Pablo bay maintaining a cool canopy microclimate with warm leaf temperatures from the sun. It is this feature that balances the refined tannins of aging ability with the warm astringent tannins that are so texturally important to the structure. The block of grapes chosen are considered “Old Vine”, planted in 1937 by Louis M. Martini. Louis planted them on four different root stocks of which no one has a record. They have been dry farmed for most of their lives and are speckled with disease and tractor blight that shapes an interesting array of taste characteristics in the fruit. Some of the viruses actually delay maturity enough to get a wonderful mature tannin and ripe flavors with reasonable alcohols.